Most Players featured in our Stroke of Genius series carry hefty resumes. The Johnny Archers, Earl Stricklands, Buddy Halls � we know what they are capable of because they've assembled Hall of Fame careers with nearly countless titles. But this month, we spotlight a player who has yet to ascend into pool's pantheon of legends, though Jeffrey Ignacio appears to have the talent to make the climb. 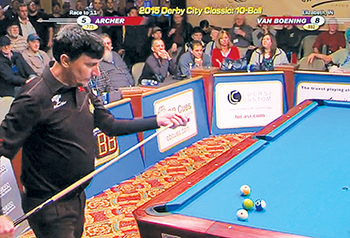 The 22-year-old Filipino made his U.S. debut at this year's Derby City Classic. For our purposes, we'll look at his second round match in the 16-player, single-elimination Big Foot 10-Ball Challenge. Facing Dennis Orcollo, currently the best Pinoy on the planet, in a race to 11, Ignacio came to the table down, 3-1. After sinking a combination with the 1, he was left in the unfortunate situation shown in the diagram. With the 1 ball against the long rail, Ignacio had a full table and plenty of obstacles between him and the 2 ball on the head rail. Using inside English and a firm stroke, he sent the cue ball four rails for perfect position to keep his run going. 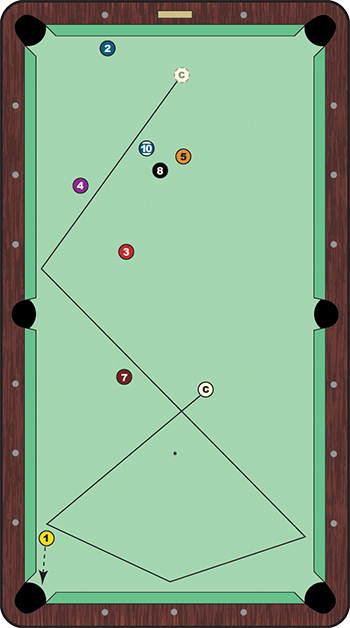 After the cue ball hit its fourth rail, the right long rail, it slipped past both the 4 and 10 balls for its final position. As you can see in the diagram, his margin for error was virtually nonexistant. The cue ball rolled first rolled to the right of the 4 and then the left of the 10, both object balls coming within millimeters of the white ball. Boosted by shots such as this, Ignacio came roaring back on his countryman to take the set, 11-8, and a place in the semifinal. He fell to Lee Vann Corteza in the semifinal, finishing third in a talent-loaded field.